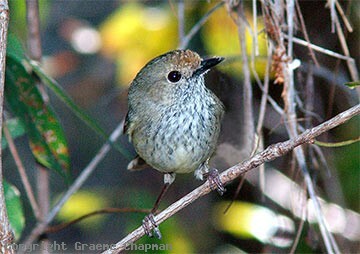 Brown Thornbills are birds of the undergrowth and shrubbery and inhabit a wide variety of dense vegetation from rain forest through to open heath, acacia scrub and even suitable suburban parks and gardens. They range from near Proserpine in Queensland down the east coast to Tasmania and west to Yorke Peninsula and Kangaroo Island. 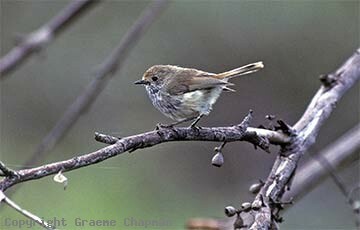 Not just coastal, they also occur across the Great Dividing Range to the woodlands in the central west, where they meet and sometimes intergrade with Inland Thornbills. Some people even regard these two forms as a single species. 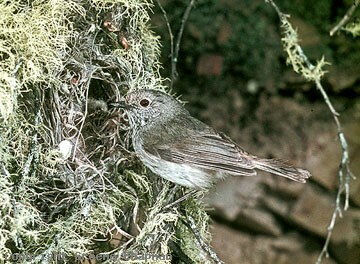 Brown Thornbills spend most of their time in thick vegetation within a few metres of the ground - only occasionally do they forage further up in the tree canopies in search of food. Adult pairs live permanently in small territories of up to about five hectares, feeding mainly on insects, and occasionally seed or nectar. Fairly confiding little birds they will usually allow a close approach where you can easily see their distinctive streaked breast and red-brown eye. They are also fairly noisy and their musical little song (listen on sound page) and buzzy contact calls are often the first sign of their presence. They are also quite good mimics. 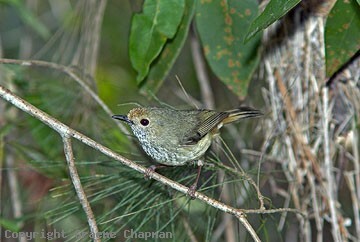 475202 ... Brown Thornbill. Canberra, A.C.T. 475203-D ... Brown thornbill, Beerwah, Queensland. 475206-D ... Brown Thornbill - red-brown eye, scalloped forehead and streaked throat and breast - from Glasshouse Mountains in Qld.